Does Twilight Complete Dracula's Aim? I don't know how this thought never occurred to me before; it's so simple and obvious. Maybe it has been talked of before; maybe it hasn't. Sometimes I think distance from a subject can let you see broad concepts that you might have glanced over before when you were thinking more (or more often) about the subject. As I was watering the garden this morning, I was thinking about how some people have accused (or simply stated this fact) Twilight and other fiction like it of defanging vampires and other supernatural beings (like werewolves)--let's just call them monsters for the sake of simplicity. I guess these people preferred stories involving monsters to be scary and therefore for those monsters to remain monsters in the traditional sense rather than be redefined as something else. Then my thoughts started drifting toward Dracula and what the vampires are like in that book. And then it all came on me in a rush. What? Dracula was written coming out of the Victorian era, and while you can look at it as simply the good humans fighting the evil vampires, that isn't really what it's about. It's responding to the concepts of prejudice, hypocrisy, etc. that the Victorian era was becoming known for: it's trying to show that the people are just attacking the vampires, calling them evil, and essentially doing the same things that they're saying make the vampires evil--they're saying vampires must be eradicated because these things and yet they are the ones doing these things. So you could kind of say it's a book about how people need to stop judging others, look at their own lives, and basically all get along. That sounds familiar. It's exactly what one of the themes in Twilight is (also in Harry Potter, except instead of vampires and humans there are magical and non-magical people--werewolves and house-elves--and in lots of other fiction right now). Basically there are just different types of people, who all make choices about what they do. Some are good, some are not, some make bad choices even when they're trying not to. But it has nothing to do with the outer idea of what is first perceived by others about them: as Bella puts it in New Moon, "It isn't what you are, it's what you do." And, Bram Stoker himself aside, isn't that exactly the type of thing Dracula would have wanted to see in fiction in the future? For it to be about the facts of who people are and what they decide to do, not about certain groupings of people who can't get over their pre-conceived ideas of one another. Granted, I know that Dracula is a relatively young book and there were plenty of other supernatural stories before it came around, but it is considered one of the major vampire books. So I find this connection very interesting. I don't really drink soda but I think chocolate soda is the coolest thing. Because if I think about it, when I do drink soda, I like it to taste sweet in a vintage sort of way and also have an interesting flavor I can think about that will help me get over the unappetizing carbonation (sorry to be so soda snobby, but if you don't drink carbonated drinks for a while, those bubbles really do make you draw back). Root Beer and Cream Soda are the standard flavors that do this for me, or I'll try some of the vintage style sodas from World Market. And chocolate soda meets the criteria, too, though I've only had it once (apart from the rather disgusting Hot Cocoa soda from Fizzies); it was from Rocky Mountain Chocolate Factory (World Market usually sells those, too, though). And when it comes to flavors in chocolate, hazelnut is one of my favorites. It has that creamy nuttiness that makes chocolate feel and taste so smooth; I love it. 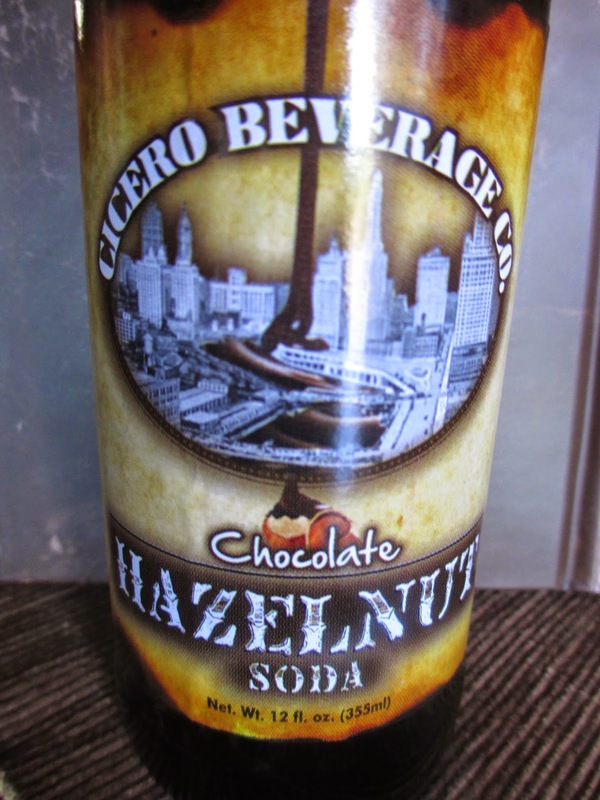 So when I came across a Chocolate Hazelnut Soda from Cicero Beverage Co. (at World Market, yes), I decided that it would either be disgusting or very, very enticing. You see, the problem with chocolate soda (as with many chocolate products) is that the chocolate element is usually artificial. I guess it's hard to get real chocolate into soda? For whatever reason, it's usually artificial and so it also tastes artificial. The ingredients list on this particular soda lists, sneakily, "natural & artificial flavor." They're trying to hide which elements are artificial, as though they think they can trick me. But I see through the disguise. I taste artificial chocolate. Who knows, maybe I'm not an expert and there is also some real chocolate in there, but my guess would be that there is either none or very little. So. There is that. And I'm glad we got it out of the way because, artificial flavors aside, I really like this soda. It tastes like caramel and vanilla and cane sugar, with a swirl of chocolate and an edge of nuttiness. It's like all the flavors of a bowl of vanilla ice cream with hot fudge, caramel, and hazelnuts mixed in; except instead of having all those different textures and temperatures, you get it all in one beverage--just with that pesky carbonation. This is why I've been known to take three days to finish one soda, if I finish it at all. I'm so weird. Even this one, which I say I like, I'm sipping so slowly that you can barely tell anything is missing from the deep brown bottle. I suppose I shouldn't be surprised that I like it. Though I don't remember hearing of Cicero Beverage Co. before, their labeling looks fairly polished. The single sticker label mimics a piece of worn paper, with an image of chocolate syrup pouring out into a city (I suppose Chicago since that's where the company is based out of). Vintage feel, urban feel, a tad of quirkiness. Yeah, that's about what this soda tastes like. A while back, I read a food article where the writer mentioned her disdain for ever eating a donut that is not a gourmet donut. And I was a little disgruntled at that: Arizona doesn't really have gourmet donuts. There are now one or two new places that I haven't been able to try (seriously? who's only open until eleven in the morning? ), but at the time there was nothing. I couldn't get a gourmet donut if I tried. I had never had such a thing or seen such a thing, so why should this writer have disdain for me just because something isn't available to me? Slowly things developed, including this idea in my mind of trying to make donuts myself. And, well, then someone I know got a little deep fryer and, wow, I got excited. I used this recipe from Epicurious (well, I don't have a stand mixer, so I didn't follow everything line by line). And I've figured out that using yeast is so much fun. Yeast used to scare me: I worried that the dough wouldn't rise right or that something would go wrong. But everything went just right. The dough rose and the donuts formed. I didn't have a doughnut cutter, so I used a small glass bowl and cut out the circles in the middle with a knife; I thought this was very odd until I later bought a donut cutter and the dough kept sticking to it worse than it did on the bowl (maybe I just made a stickier dough that time, though?). Oh, yes, and then I put them in the fryer and was so very excited to watch them fry. The glaze is super easy, basically just powdered sugar and milk mixed together; add cocoa powder for chocolate. (They look kind of silly in the picture because I started out glazing in stripes and then wondered why I was doing that.) So you see what I'm getting at here? Donuts are considered a very unhealthy food and maybe they are more unhealthy than sautéed vegetables, but they don't have to be evil. I used organic ingredients, good quality cocoa powder, and sunflower oil for the frying. Because I had control over the ingredients, I got to choose what they were: there was nothing nasty in them. And they tasted so much better, too. 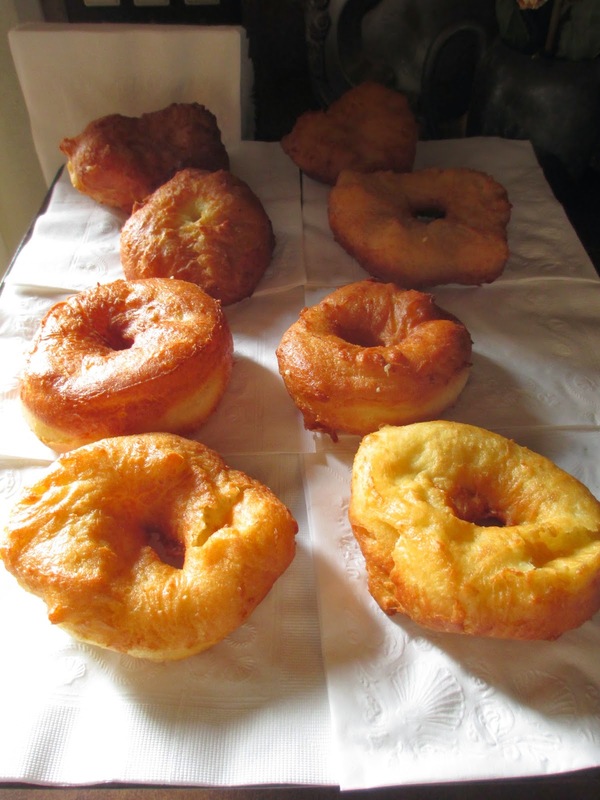 Straight out of the fryer, the outside of the dough is crisp and the inside is soft like bread. The glaze tastes like sugar or chocolate, not strangeness. I was amazed at what I could do if I just tried. Not long after, I randomly decided to make an apple pie. It turned out less perfect than the donuts, but acceptable for my first apple pie. This weekend I made a loaf of French bread that was great except for the fact that it was a tad salty (I used what the recipe said . . . ). Each time, my horizons keep broadening. Each thing that I make, the more powerful I feel to try something else. Less processed food while still eating a variety of foods, that's what this means. Homemade is better. I had this theory that Disney was trying to see what audiences would respond to more: a non-traditional retelling of a classic Disney story in Maleficent or a fairly traditional retelling with Cinderella. Or maybe two teams happened to have very different projects (with very similar bases) that they wanted to work on at the same time, and Disney was up for the diversity. Either way, I think it all worked out well. I don't know why it took me so long to see Cinderella since I did really want to watch it, but there were still plenty of people in the theatre when I went. And I had an absolutely wonderful time watching this movie. It's so subtle in the way that it sticks closely to Disney's original animated movie while also modernizing the 1950's themes. There was no need to make huge changes to try to be original, and there was no need to make huge changes to "give girls a strong female role model." Cinderella already is a role model--and not just for girls. She is patient and she works hard at every task life gives her--and that's in the animated movie, despite a bit of an emphasis on cleaning. This new movie built on that character, emphasizing not necessarily her cleaning of the house but her kindness. And kindness is a virtue we can all work on and would all benefit from working on, in so many ways. They also played up on her young and innocent side, pairing a bright outlook with the idea of magic. And that bright outlook is a lot like hope, something fiction can never have enough of because it is so vital to life. I always appreciate a good message of hope--and of promoting good rather than bad. I tell you, it's the subtle things that made this movie soar. When the end of the movie comes, Cinderella simply walks away from her stepmother and stepsisters, essentially ignoring their threats and pretenses (i.e. their attempt to get something for themselves out of her new situation). She does not need to tell them off or yell at them now that she is no longer under their control: that would not be kind, nor would it benefit anyone. But she does need to walk away: they have ill-treated her and it would not be good for her or for them to let any trace of that continue. Sometimes certain people are not good to keep in our lives--though, at the same time, that does not mean that we need to act out against them. We just need to leave and start our own lives. Lily James played a graceful character not overdone in her sense of goodness yet still lovely in her desire to be good to whatever people (or animals) come into her life. Richard Madden played well the man in love with her bright outlook that, in turn, makes him willing to change the way he goes about even everyday actions. Cate Blanchett, I didn't know you could laugh so haughtily; you were boldly wonderful. Sophie McShera and Holliday Grainger were so fun to watch that I think they must have had such fun playing their roles. Oh, yes, and we mustn't forget the Lizard Footman--he made me laugh. Such a lovely score from Patrick Doyle, such lush scenery, and what lovely outfits Sandy Powell put together. The fabric, the patterns, the colors, oh, just gorgeous. The way that the ball gown actually flows and sweeps about, as much like a dream and a cloud as it is in the animated movie, I don't know how she did it. And that wedding gown was gorgeous with all the flowers. That's how this movie was: just a dream. It was lovely to look at, lovely to watch, and lovely to think about. It was the very essence of Disney and the very essence of the Disney approach to fairy tales. It's a treasure for generations to come. As many others, I have been entirely enjoying Ian Doescher's William Shakespeare's Star Wars series, which started with Episodes IV through VI. I was hoping he would do the prequel trilogy and look at this, all three come out this year, starting with The Phantom of Menace. Let me get it out of the way: I think that both the original and prequel trilogies, as films, have strengths and weaknesses, so I am willing to defend either trilogy as the need may arise. So I was happy to see that the prequel stories are getting the same treatment as the originals had. In fact, they're even getting better treatment: back when Ian Doescher started with the first book, it was a stand-alone type of thing, it was sillier, and the dialogue was much more similar to the lines in the movie. With each book that he has created, however, he refines his technique, adds more to it, becomes more subtle, and makes something that is greater than a silly diversion. The Phantom of Menace didn't make me giggle as much as some of the others did, and I didn't mind because I had slowly been transitioned into something new. What began as a novelty has become something grand and poetic in its own right. Borrowing Shakespeare's flow of language and vocabulary, Ian Doescher has seamlessly transition the world of Star Wars into the world of an Elizabethan play. It's seamless--it really is. The language is just right and better than ever: not only are the existing lines given a Shakespearean twist, but there is also more bulk given to each line. Characters take a moment to reflect on the meaning of their situation, or the meaning of something that has been said--not just to deliver their lines; that's very Shakespearean. And then there is the content. When the form moves so much into this Elizabethan feel, the content is not the thing to hold it back; rather, it helps it along. Episodes IV-VI are a wonderful, classic story. But Episodes I-III are more complicated and more tragic--and that is perfect for Shakespeare. It's a very political story and a very social story, with dramatic character relationships. If ever you doubted the worthiness of the prequel trilogy, please read this book: it will make you realize, if you have somehow not realized it before, that there is plenty of meat behind the computer effects and Jar Jar Binks. Speaking of Jar Jar Binks, he is one of the biggest changes in this book; he is, if you will, the silly element. Except that, while he is a silly character in the movies because he's mostly a comedic character, he is the silly element in this book because he is made smart. He is smart, but only feigning simpleness because he knows that is what other characters expect of him and so that is what will help him achieve certain ends. It's smart because it solves how to not let him be annoying. And it's smart because the idea of dual identities makes sense for Shakespeare (everyone is always disguising themselves in his plays) and for the story (Padme disguises herself, Palpatine disguises himself, even Darth Vader is later disguised in a certain sense). It's like all of the wonderful things about this story have been taken and polished into Shakespearean language and then given to us as gleaming lines to remind us of why this story is one of the best ever. I love Star Wars. I have other posts in mind right now, other things I could be talking about. But there is one random thought going through my head that I wanted to get out before it fades. You see, I looked in my closet the other day and wondered who it belonged to. A few years ago, I found myself at that point where I no longer get rid of clothing because it doesn't fit me anymore (it's called growing up). And around that time, I was also trying to get more quality clothing. Less synthetic materials, less things with elastic that tends to wear down more quickly. Oh, yes, and be friends with washing clothing by hand: even if an item doesn't have to be hand washed, do hand wash it if you know it'll last longer that way. And try to air dry as much as possible. But I digress. My point is, I now have clothing that is new and that is eight years old and everything in between. I've come to have a fairly specific style and a decently good idea of what I do or don't like when it comes to clothing. So around the time I graduated college, I was at a high point, loving my lace dresses and colored tights. But style changes depending on where you are, what you do every day, and where you are in life (also your daily mood). And when I looked in my closet the other day, I realized that it's still the closet of a college student--and I wasn't sure what I thought of that. The closet of a college student can mean many things. I wasn't the type to show up to class in sweats (I hate hoodies and sweats are pretty much the same thing--in fact, I don't think many literature students wore sweats). I was the type to try out crazy outfits just because college is that time in your life where it doesn't really matter what you're wearing. I'd wear dresses and vintage hats and brown shorts with lavender tights or this really weird outfit where I put green tights and a green shirt under a black Banana Republic dress. By trying things out, I figured out what I liked and what worked. But now I'm realizing that what worked then doesn't necessarily work now. Where I'm living now, a lace dress that I wore to class on a regular day is considered a very nice dress--so I find myself wearing dresses like that less often or trying to dress them down as much as I can. But then I realize that much of my closet is made up of simple, girly dresses like that. And I wonder if that's a good thing. When you're in your twenties, you can pretty much wear whatever you want (aside from how you need to dress for work). You can dress a little older or a little younger; it's all fine because you are at that in-between age. But I generally think that if you can or feel like it, you shouldn't try and dress older than you are. I used to wonder why people in their twenties dressed the same as people in their forties. And then I realized that these are people who probably shop at places like Ross, Wal-Mart, JC Penny's, and Sears for their clothing (other places are considered more expensive, although you can sometimes still get better deals if you have the time to look--but sometimes other stores are also farther away). And stores like this tend to jump right from the teen clothing to the grown-up women clothing: there are no in-between styles. That's why I like Anthropologie and Chelsea & Violet and MSSP from Dillard's: for the most part they're clothes that aren't for a specific age group and yet there's youth in the playfulness and originality of the styles. But how far should you take playfulness? Given that I am short and thin, sometimes people still think I'm sixteen--at which point I have to assure them that I'm two years out of (four years of) college. So I stay away from the shirts with animals on them or things like that that I think would help make me younger. I add in some Antonio Melani pieces, or pearl earrings (I don't feel the need to wear shoes to make me taller). But I'm still wearing the pretty dresses and lace shirts, and now I ask, to what identity does that clothing belong? Is it of a free, creative young woman who enjoys life? Or is it of a woman still searching for stability, still thinking that she is that young college student who was trying things out instead of maintaining things and working toward specific things? So what do you think? Is there a time when your wardrobe needs to gain a little more seriousness, or is it okay for it to remain fun and original? Okay, so this is just weird. I don't think I've ever had this happen to me in nearly seven years of chocolate reviewing. I bought an improperly labeled bar of chocolate. Recently when I was at the Desert Botanical Garden in Phoenix, someone pointed out to me the prickly pear chocolates and I answered that some of the ingredients looked cheap, so I wasn't really interested. 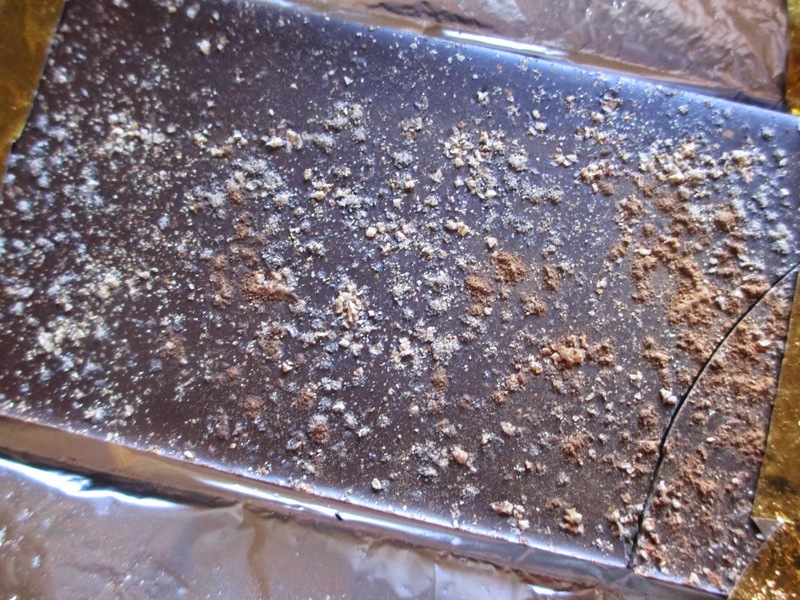 Then the next time I went, I saw a collection of prettily-wrapped chocolate bars that list cacao beans and cane sugar as their main ingredients, an instant positive. Did I just not see them before, or are they a new item? To add to it all, one of them was Rose Petal and I adore rose products (just have a look at my perfume collection). 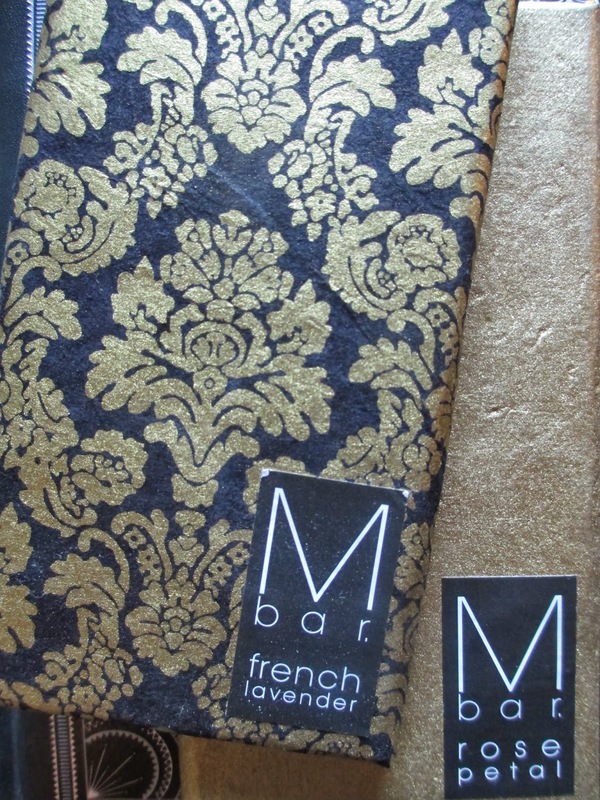 There were some bars with open packaging, where you could see the rose petals or other flowers, but I chose a closed bar in beautiful gold paper: I've seen open packaging before but I don't know when I've come across a chocolate in such pretty paper. 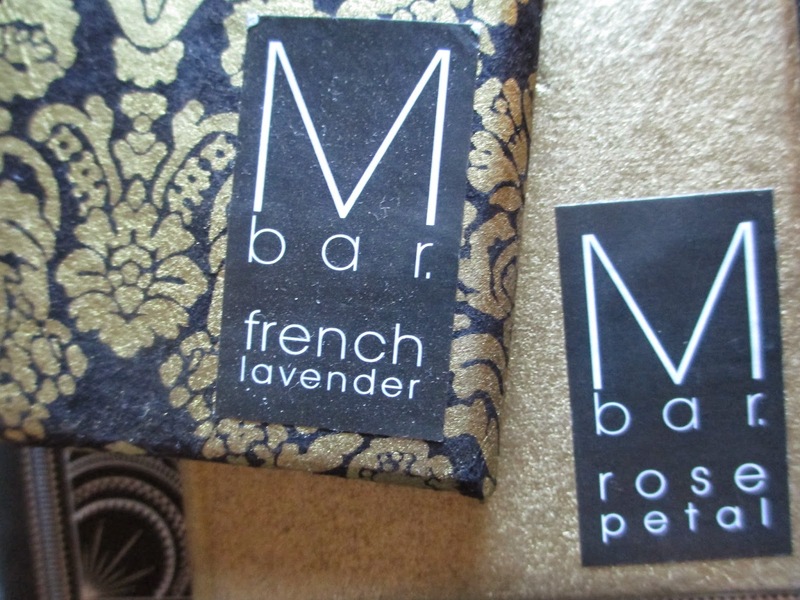 The black and white patterned bar on top is my friend's; she chose French Lavender. I know I mentioned how happy I was about seeing cocoa beans and cane sugar as the top ingredients, but I admit I was a little suspicious of the fact that the flavors are simply called "Love." Okay, I suppose I understand that you don't want to give away your secret recipes, but what's so secret about saying that you use rose petal and vanilla? Unless you use artificial rose or vanilla flavor? It's a little odd, right? Oh, yes, and don't glance over that $15 price tag. Granted, these go for about $10 online and it is a large bar at 100 grams, but still, it's expensive. I might have been more hesitant if it hadn't been Rose Petal and in such pretty gold paper. I had a wonderful time unwrapping the hand-folded paper to reveal gold foil and a gorgeous--wait, what? Instead of seeing delicate, pink rose petals, I saw what looked and smelled like cinnamon and other powdery ingredients (I guess this is what "Love" looks like). For just a moment, I thought that maybe it was the right bar: maybe the ones in the paper wrappers were different from the ones in the clear wrappers. Maybe these had other flavors mixed in, as well. So I tasted a piece, only to be immediately hit by the taste of spice. If you've been reading my chocolate reviews, you'll know that I grew tired of chili chocolate a long time ago, after maybe the first two or three I tried. If it isn't done expertly well, it tastes bad, and even when it's done well, well, I don't like my chocolate to sting my mouth. Chocolate's too elegant and smooth for that (the way I like it, that is). So of all the flavors to get instead of rose, a spicy chocolate was not one to make me happy. I was sad and amused . . . and really sad. I wanted rose chocolate. But since I have this one in my hands, I might as well give some comments. It appears to be the Exotic Chile Cardamom bar instead of the rose one. Cardamom and chile spices. Yay. I still don't love chili chocolate, especially after being taken by surprise like this, but this is one of the nicer chili chocolates I've come across. 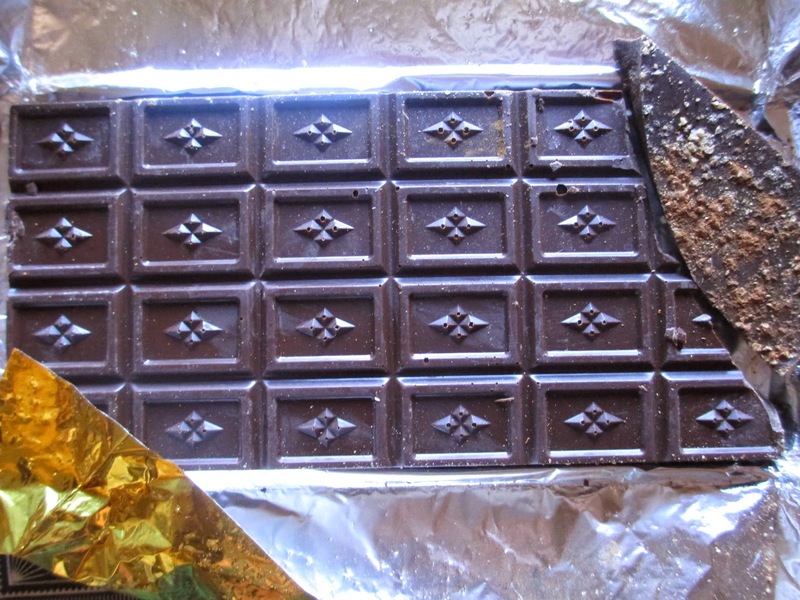 The chocolate, though dark, has a mild degree of sweetness to it; putting that together with the cardamom helps give a softness to all the spice. Sometimes with spicy chocolate, you lose depth of flavor; here, you can still taste the chocolate and also the cardamom, so that gives your palate some depth to explore. It's fairly nicely done, I admit. For the curious, my friend's lavender chocolate did have lavender and, no, I haven't tried it. For that matter, I don't know if I'll ever try the Rose Petal bar: I don't know how long it'll be by the time I find myself back at the Botanical Garden and even then, I might still be a little frightened to have the same experience again. 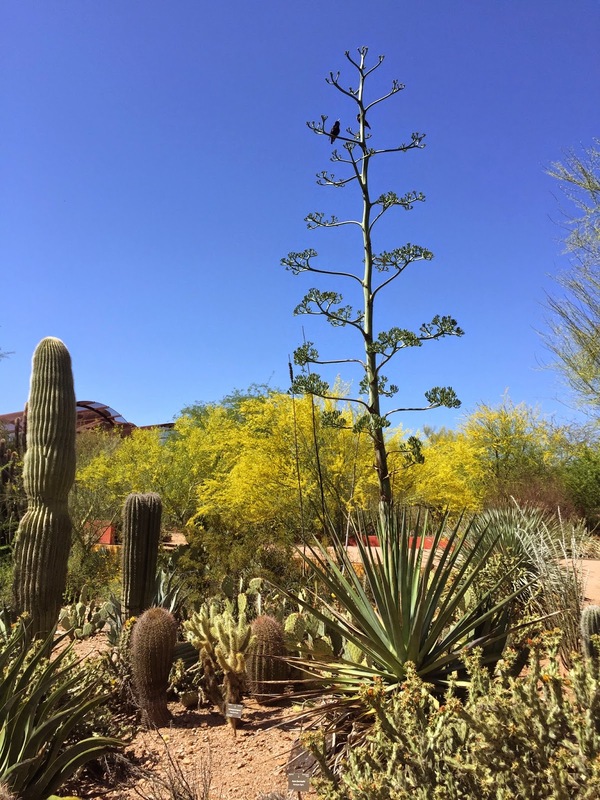 The Desert Botanical Garden in Phoenix - A nice introduction to the great variety of cactus and succulent plants that are out there, this garden can be a casual and brief visit or a longer walk through all of the paths. It's also a good place for lunch. Out of Africa Wildlife Park in Camp Verde- Such a good park with such a good philosophy, Out of Africa is always fun to visit. You get to see the animals (and feed a giraffe and a tiger), take lots of pictures, and also immerse yourself in some of the vegetation of the Verde Valley. Predator Zip Lining at Out of Africa - Thrills or sightseeing? It's kind of both. A series of zip lines above the park is exciting and fun, while also giving you a great view of the lions and tigers and of the mountains surrounding the valley (including Sedona's famous Red Rocks). Verde Canyon Railroad in Clarkdale - A four hour, roundtrip ride in a vintage train to the ranch at Perkinsville (you don't get off the train there) and back, this ride lets you take in the scenery of the canyon. It's sort of like a more immersive experience into a lesser Grand Canyon (you know, unless you're one of the relatively few to raft or hike down the Grand Canyon). Blazin' M Ranch in Cottonwood - It's an old, family-owned ranch that's set up like a little Western town. You can take pictures, wander the shops, practice shooting (not with real bullets), take Old Time pictures, and then everyone goes into the main area for dinner, with a show to follow. Though it's sort of a touristy concept, the singers are good, so if you want a little silly Western feel, this is the place. Petrified Forest National Park in the Painted Desert near Holbrook - I adore the Painted Desert. I absolutely adore the quiet feeling of the land, painted in colors of red, pink, white, purple, and blue with still and sparse vegetation. It's like sunrise stretched across an open land. Visiting the Petrified Forest, you get a look at the Painted Desert without having (unless you want to) to hike around much; you also get to see some big collections of petrified wood. I recommend the Blue Mesa trail. Sedona - Sedona is the land of the Red Rocks, stretching up toward the sky and calling many, many visitors every year. There are trails, shops, restaurants, and Red Rock State Park. Slide Rock State Park in Sedona - Where the river climbs down the mountains, there is an area that makes (by itself) the equivalent of water slides. It's all at your own risk, so do be careful, but this area is always popular, whether for those wanting to slide through the smooth rapids, wade in the calmer water, or simply take in the sun and the short trails. 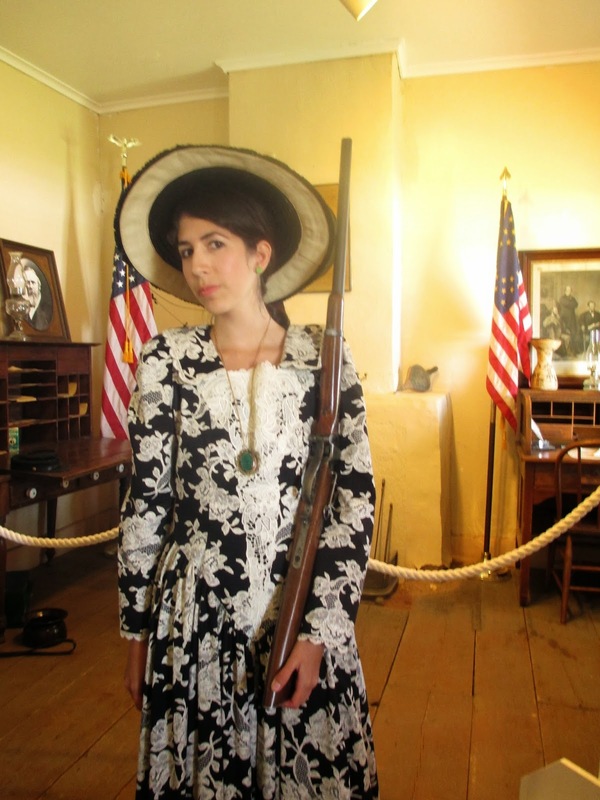 Prescott - I'd recommend the Sharlot Hall Museum, where there is a small collection of historic buildings and a great gift shop (it has candy and books and toys and things). It's just a block of two from the Square, which is a quiet, tree-shaded place for a stroll, surrounded by shops and antique stores. Eat at Bill's Pizza. Jerome - You have to stop at Jerome even if you don't go anywhere or do anything while you're there: the views of the Verde Valley are wonderful. Jerome was a mining town built up on the mountainside; it became a ghost town after the mines were abandoned. Now it has a few shops and a couple restaurants in the old buildings, but mostly you go just to go and to walk around a little. Jerome State Park is also a good place to visit if the town is new to you. Grand Ganyon National Park - Usually I like to talk about how Arizona has a lot more than the Grand Canyon and a lot of Arizonans don't even live close enough to it to visit very often, but if it's your big trip to Arizona, naturally you should try and make it over. If you can stay longer, do, but just one day is fine, too. You can stop at the viewpoints and gift shops, picnic outside, go see the Desert Watchtower, and maybe hike partly down South Kaibab Trail. Montezuma's Well and Castle - These are quick stops, but they're some of the more easily accessible, well-preserved examples of cliff dwellings (left by the Sinagua). Flagstaff is also good: I love Sunset Crater/Wupatki National Monument, and there's also a nice arboretum and an observatory; but Flagstaff can be good if you're visiting in the summer because it isn't as hot as much of the rest of the state. On the opposite to that, Tuscan and the areas around it have some traditional desert views: there's the Saguaro National Park and Picacho Peak State Park and I think one more area that's slipping my mind. It's such a lovely state. Such variety of beauty. So many different kinds of plants, so many animals, and so many natural features that you can just spend months and years exploring. Ugh, I thought I only got headaches from long 3D movies. Insurgent wasn't long, but I still had a bit of a headache afterwards--and do you know what? It probably wasn't even worth it. Months ago, I saw the teaser trailer (the one where Tris is saving her mom from the burning building) (probably in 3D) for the movie and thought it didn't look like anything I would want to see. Then, as you know, I watched Divergent last month and really enjoyed it and then read the books. While Insurgent is easily a least favorite just because it's at a sad point in the story, I was still looking forward to the movie. And then I was kind of disappointed by it--but not for the same reasons as with the book. With the book, there's a lot of violence and you see Tris at a really low point with a lot of anger and grief that makes her act out not always in the best ways. But I was prepared for that. What bothered me about the movie is that almost all of the character development and interaction is removed. I understand that there are many characters and that they're not all necessary to a two hour movie plot and I do appreciate when a movie can movie toward a single purpose without getting bogged down by less important details. But in order to do that with a book to movie adaptation, you have to interpret what is most important about a story. So they made this movie about the interaction between grief and self-image. The grief is definitely part of it and the self/image, too, but I think community and relationships was a big aspect that was barely touched on. It is community and relationships that show Tris that she is appreciated (by Tobias, by Christina, and by other friends and people she knows) and help bring back her confidence and optimism. And what did the movie do with all of these relationships and communities? It glossed over them entirely, in favor of action shots and scenes that often had little to do with anything. Where is Tobias getting mad at Tris for not telling him sooner about Will? What about his confession that his greatest regret is leaving Abnegation? Where is the reconciliation of Christina with Tris after she admits that it wasn't Tris's fault? Where is the detail about Marcus--the information he knows and Tobias's feelings toward (or should I say against?) him? Uriah is barely in the movie, much less Tris's other friends from Dauntless--and her feeling of being part of Dauntless is important. And what's this with changing the secret that Abnegation was protecting and the thing that Jeanine is hiding? They both already knew the message: Abnegation wanted everyone to know it and Jeanine didn't want the public to know it because she was afraid of what would happen if their society changed. Given that the faction society is one of the compelling things about this story, I don't take it lightly that this crucial story element is changed. And why does the end of the movie show everyone walking toward the wall when that is most definitely not what happened? Oh, yes, and then there is the removal of Tori's need for vengeance against Jeanine--isn't that also important? True, movies try to keep the focus on the main character and not take too many side journeys, but if there was enough time to add in a long scene of Tris rescuing her mother from a burning, floating building in a simulation, then there is enough time for Tori's story. Yes, this is part action story, but not so much that all it needs are random special effects--special effects that I wasn't even wowing at with my 3D glasses. I just wanted to get back to the story and the characters. I'm just complaining, I know. But there were some things I liked. I still feel like the movie is well cast and that the actors do a good job with what they're given. The first fewish minutes of the movie were probably my favorite: Amity was well-done. Their clothing, their setting, the way they move and talk. Peter pointing out the rainbow to them was hilarious. And seeing Tobias in a new setting helps to show that even though he played Dauntless well, he isn't entirely Dauntless. The sets were still good. It still looks like a very specific place. So I liked seeing some things, but not necessarily the way the movie played out. Someone please remind me, why is Allegiant going to be two movies when this story works so perfectly as a trilogy and when the movies seem not to be understanding how to portray this story anymore? Sigh. Sorry I've been so absent: I was on a sort of Spring Break exploration all across Northern and Central Arizona, playing tourist for the benefit of visitors from out of state. I thought I would still be able to post, but we were so busy (having such fun) that I couldn't. So here are my belated March Favorites. 1) Arizona Books - Maybe it has something to do with the fact that visitors were coming in, but I've really been delving into Arizona lately. I love this state--and now I want to start reading more about it. So I've been going through the books I already owned and buying more (at almost every museum or state park store we went to during this past week, as if I didn't already have so many books). 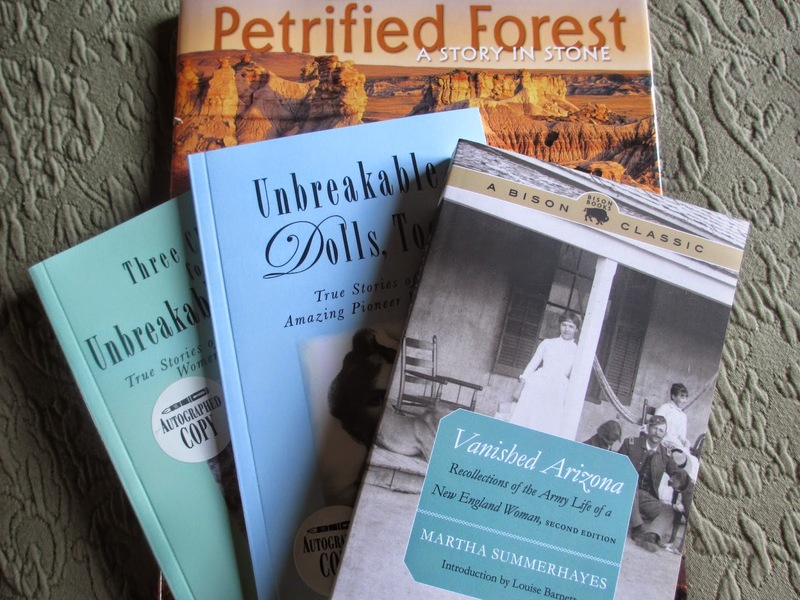 Some of the ones I was most excited to get include Vanished Arizona by Martha Summerhayes, Julie McDonald's two newer books, and a book on the Petrified Forest. 2) Tarte Lights, Camera, Lashes Precision Longwear Eyeliner - I've mentioned before how I can only use liquid eyeliner on my eyelid (and how eyeshadow instantly creases if I don't use primer); since I try and use mostly Tarte products, I had settled for their (mostly mediocre) liquid eyeliner. But then they came out with this new one, which is basically a felt tip. It's much less watery, meaning that it's much easier to get a thick line if that's what you want or even to do a cat eye. It still creases on my weird eyelids by the end of the day if I'm not wearing eyeshadow, but when I am, it's great and much better than their other liner. 3) Ellie Goulding's Halcyon Days (Deluxe Edition) - Last month I said I was getting interested in Ellie Goulding's music, so I bought this album and it was almost all I listened to all through March. "My Blood," "Only You," "Figure 8," "Joy," "Hanging On," "Explosions," "Dead in the Water," and "Hearts Without Chains" are some of my favorites. 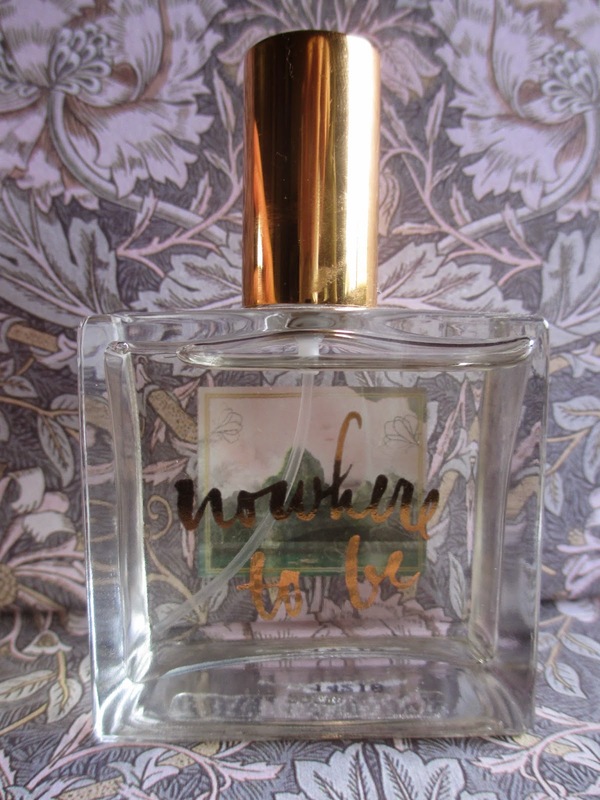 4) Momentary Escape Perfume in Nowhere to Be (from Anthropologie) - Actually, it was Dream at Dusk that I really liked, but by the time I was ready to buy it it was gone. So I had to at least get this one. I has a marshmallowiness to it that reminds me of Lollia's Wish, just maybe not quite as perfected and elegant and magical. Still very nice, though. 5) Magnet (Hematite) and Polished Stone Rings - Since I've been going around to some of the tourist shops, I picked up these four rings and then found them a pretty good deal. They're a dollar or two each and they're stone; I like real materials. I have the hematite, a green one, a pink one, and a black and white one. 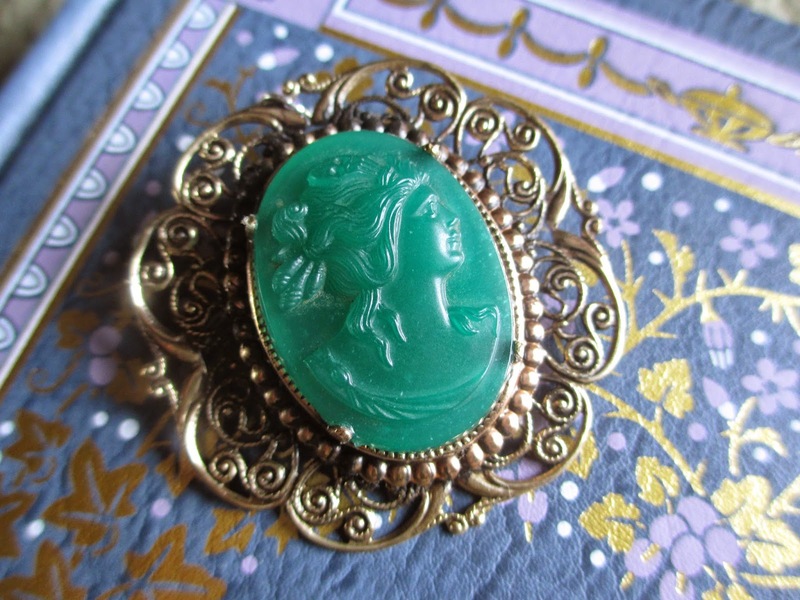 6) Green Cameo - Okay, so we all know I like green. And especially after I got my green glasses, I've been wearing even more green. So when I saw a couple of pink cameos for sale, I had to get one. I don't know what the material is, but the cameo is supposed to be old while the setting is new. It only came with a pin back, so I chose the one that had space where I could add in a loop for a necklace. I do wish the setting were smaller, but I really like the cameo itself. It's green. 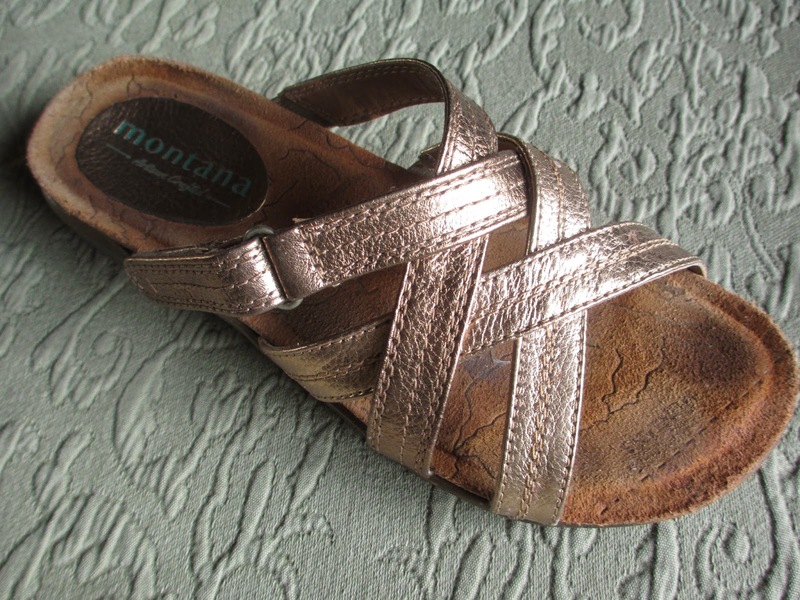 7) Montana Ulla Shoes in Bronze - I wanted some sandals for summer that would have some more support for my feet but wouldn't look like they belong to a, um, rather older lady: I don't want to wait until my feet and knees hurt to look for better shoes. But it's hard because I have narrow feet and most of the "comfort shoes" are wide. These shoes are pretty basic and neutral in their style, have some support, seem durable, and are comfortable. The only thing is that when I first wore them, I was walking around all day and they were irritating the outer side of my feet and maybe also my smallest toes. I'm hoping I just need to break them in more because otherwise they seem like they'll be great (I do think that's going to be the case). 8) Tarte Eyeshadow Palette - This is the palette that came with the Christmas set and I've been loving it. It's the closest Tarte has brought me to the Naked Palette: it has a lot of neutral colors and shades of brown and grey, with just a couple on the purple and blue sides. You can make a soft, barely makeup look or a more standout look--and have fun mixing and matching the shades. 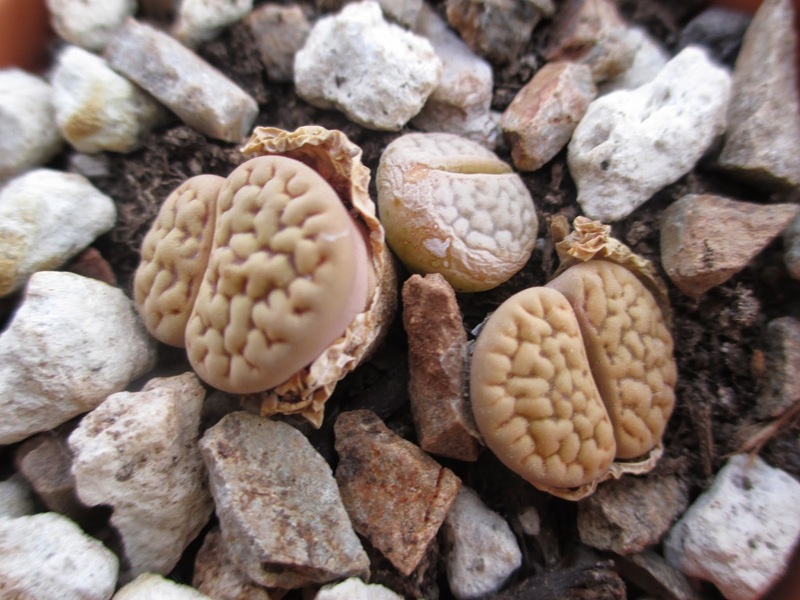 9) Living Stones (Lithops) - I used to have some of these, though mine were more colorful. They're so weird, so naturally I adored them but I haven't been able to find anymore until the last time when I was at the Desert Botanical Garden in Phoenix. Now I'm super excited to have them again. 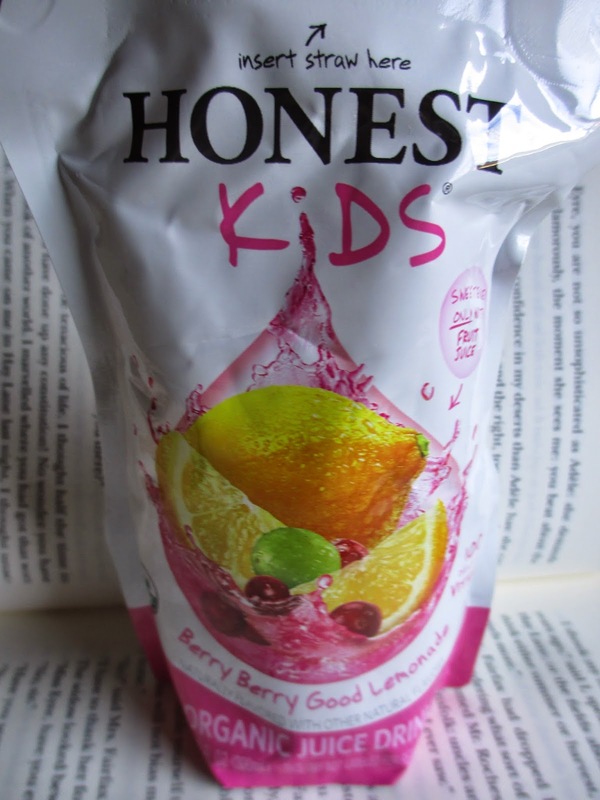 10) Honest Kids Berry Lemonade - Completely random item, but given all that time spent playing tourist (I'll go over some of our stops later), we often had a big cooler of drinks with us. I discovered these lemonades, which are in packs like Capri-Sun (which is the nostalgia factor) but have berry lemonade that is sweetened only with fruit juice, which means I enjoy it. I don't know exactly what berries it tastes like; it's just a good, basic berry lemonade without tons of sugar or artificial ingredients.